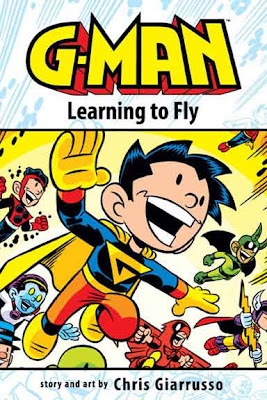 There is a new G-Man series going on right now at your comic shop! "G-Man: Cape Crisis" is just as awesome as the first series - 4 out of 5 issues have been released so far. Really great superhero stuff for kids and adults! Funny you mention that, Tracy. I have been collecting G-Man: Cape Crisis but I have not read it, yet. I'm glad to know it's good. The G-Man Cape Crisis series is the best comic series I've read in a long, long time. The first G-Man collection is excellent, but Cape Crisis is even better. The kids in the story act like... kids. With super powers. It's funny and remarkably clever, the jokes are layered in so that multiple readings will reward everyone. It's also true to real life. A+ all the way.